St. Frances was born in 1384 in Rome to a wealthy couple. When she was eleven years old, she wanted to be a Nun, but at the age of twelve, her parents forced her to marry Lorenzo Ponziani. He was the Commander of the Papal troops of Rome and member of an extremely wealthy family. Although the marriage had been arranged, it was a happy one, lasting for forty years. She experienced many sorrows in the course of her marriage with Lorenzo. They lost two children to the plague, and that sensitized them to the needs of the poor. Rome was largely in ruins; even wolves were known to enter the streets. During the wars between the Pope in Rome and various anti-popes in the great schism of the Catholic Church, Lorenzo served the Pope well. Lorenzo did however; lose a lot of his possessions and property during a period of forced exile. He was severely wounded during a battle by Neapolitan while occupying Rome, and never recovered, dying in 1436. According to tradition, her son was to be delivered as a hostage to the commander of the Neapolitan troops. Frances brought the boy to the commander, but on the way stopped in the Church of the Aracoeli located there and entrusted the life of her son to the Blessed Mother. When she turned her son over to the soldiers, the horse that was to carry him away refused to move, even after heavy whipping. The soldiers took that as the hand of God, and returned the boy to his mother. Frances advanced in a life of contemplation; she had visions from heaven, possessed the gift of miracles and ecstasy, and had the bodily vision of her Guardian Angel. She had revelations concerning Purgatory and Hell and foretold the ending of the Western Schism. She was gifted with the ability to read the secrets of others consciences and to detect plots of diabolical origin. She had heroic virtues of humility, detachment, obedience and patience. Although a mystic, she was aware of the civil chaos, which ruled Rome during the period of neglect by the Pope, and the ongoing warfare in her time. With her sister, they prayed, visited the poor and took care of the sick, inspiring other wealthy women of the city to do the same. She turned part of the family’s country estate into a hospital. On August 15, 1425, the feast of the Assumption of Mary, she founded the Olivetan Oblates of Mary, a confraternity of pious women. They were not cloistered nor bound by formal vows, so they could follow her pattern of combining a life of prayer with answering the needs of the society. In March 1433 she founded a Monastery at Tor de Specchi, in order to allow for a common life by those members of the Confraternity who felt so called. The Monastery remains the only house of the Institute. On July 4th of the same year, they received the approval of Pope Eugene IV as a Religious Congregation of oblates with private vows. The Community then became known as the Oblates of St. Frances of Rome. When her husband died in 1436, she moved into the Monastery and became the groups President. She died in 1440, and was buried in that Church. On May 9, 1608, Pope Paul V canonized her. Her body was exhumed in 1869, and has since been displayed in a glass coffin for the veneration of the faithful. In 1925 Pope Pius XI declared her the patron saint of automobile drivers because her Guardian Angel used to light the road before her with a lantern when she traveled, keeping her safe. 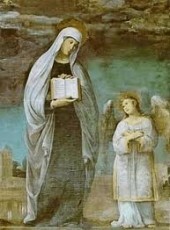 St. Frances of Rome wanted to be a Nun at the age of 11, but was married into an arranged marriage at the age of twelve. She had a happy marriage and took good care of her husband who was a very wealthy man. She spent her life in helping the poor, and built a hospital at her country estate. Her husband died due to war injuries, and she founded a religious order, “Oblates of Saint Frances of Rome” and a Monastery for the Order. She was a wife, mother, mystic, organizer of charitable services, and a Benedictine Oblate. She also had the gift of seeing her Guardian Angel in bodily form, and could read the consciences of those that she met. She did much in her time to improve the lives of those around her.